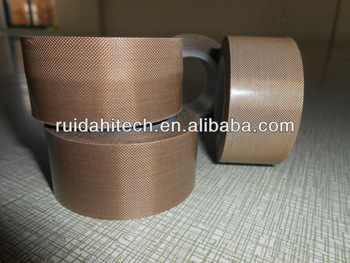 adhesive tapes is the one using polytetrafluoroethylene (PTFE) film as base material. Single surface treated and coated with silicone adhesive with excellent heat resistance. The tape exhibits superior features such as desirable electrical properties, heat resistance, chemical resistance and non-adhesiveness. 4.Can be used in a wide range of temperature (-60°C-180°C), however, it may vary according to the use condition. 1.For roll wrapping in polyethylene laminators (Suitable for long continuous use as the tape has superior durability and mechanical strength). 2.For endless belts of polyethylene laminators. 3.For insulation of coils as a class H insulating material. 4.Can be laminated with metals, plastics and ceramics as general sliding materials.